If there is a race and he can be there, he will. And most likely, he will have be they guy to beat. That he is Teddy Christopher. Everytime TC pulls into a Short Track pit area, anywhere in the country, he is a threat to take the trophy. . So when the NASCAR Whelen Southern Mod Tour show at Ace Speedway was rained out on Satrurday, it was a no-brainer that Mod fans would see TC wheelin' it at Friendship Motor Speedway's season opener on Sunday. Just last week at Caraway's NASCAR Southern Tour stop, Teddy said his win was almost like he "rode in on a horse, took the money and rode out.” This weekend at Freindship was no different. Hill's #79 car, took the win, making it two-for-two with the Hillbilly Racing Team racing south of the Mason-Dixon line. 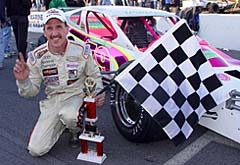 Although TC looked to have the race dominated, a green-white-checker finish and the chrome horn of Southern Mod veteran Jay Foley gave Teddy an anxious moment on the final turn coming to the checkered flag. “I knew Jay was gonna hit me. That was the only shot he really had to pass me. I'll tell you what, if he was inside of me he would have been the inside wall because there was no way he was going to get by me on the inside. Foley's bump got Christopher sideways in turns three and four, but his last ditch effort was no match for TC's defense. For TC, stealing the show at Friendship, winning the Caraway NASCAR Southern Tour opener, and his Florida Speedweeks championship is quite a way to kick start a racing season. “I can't wait to go to Thompson for the Tour race (northern NASCAR Whelen Mod Tour Opener) with the way my year is going so far,” said Teddy. “It's fun to race with the Hills. I cant wait to race a few more races with them. We have some more plans hopefully through the summer time if weather and our schedules work out to race together. And I am sure people wont like to see us show up the way we've been running. EDITOR'S NOTE: Teddy's brother Mike Christopher was recently named the driver of the Hillbilly Racing #79 for the NASCAR Whelen Modified Tour season. Click here for the story. LW Miller looked to have the race in hand. Ted Christopher was on his bumper but Miller looked as if he had the upper-hand. That is until a caution for a wreck in turns one and two took LW out of the race. Now the strange thing is, LW wasn't a part of that caution. When the yellow flag flew, LW was cruising past the wreck when the #45 of Tim McGlamery, who was involved in the incident, spun his car around to right it and ran into the leader. The contact sent Miller spinning and knocked the rearend out of the #36 ending LW's day. Ted Chistopher was not the only one Jay Foley had contact with at Friendship on Sunday. Burt Myers was coming through the field fast and got underneath Foley coming into turn three to battle for second. Foley and Myers made contact and Myers got the worst of it and it ended his Friendship run. What is most interesting in the equation is that Philip Smith, who owns Burt Myers car, is part-owner of Foley's machine. And Foley builds the engine for Myers #1. The contact between the teammates didn't sit well with Myers. Foley saw the incident the other-way around. LW has elected not to run the full NASCAR Whelen Southern Tour, but will compete weekly at Friendship. Although he will be one of the top-guns at the track each week, this was the race he wanted to win. Miller's Baker-owned racecar was on rails all day. Myers walked down the pit wall and animately let Jay Foley know that he was not happy. Myers added, “Foley builds our motors and Phil owns both cars but if that’s the way teammates race, then I don’t want one. I mean its nothing against Phillip. Jay Foley has wrecked me twice up here for the lead or wrecked me while I was passing him for the lead. I really think I had a shot at winning this race today. The 9 (Christopher) and Foley were real tight and my car was getting off the corner real good. Well it’s twice know that I have had this race in my pocket at Friendship and Foley's been the reason why I didn’t win the race. After the incident Myers walked down pit road and leaned over the inside wall to voice his displeasure to Foley about the contact. Northern invader, and NASCAR Mod Tour star, Donny Lia was another driver to make the trek down south for a weekend of racing. Lia ran in the top-three before pitting with an ill-handling racecar. He came back through the field but a controversial black flag for jumping a late-race restart ended Lia's charge and resulted in a 10th-place finish. Officials said that Lia passed Zach Brewer's #38 on the inside before the line. A few laps later, under a caution period, officials decided to give Lia the black flag. “In the drivers meeting they said you can not pull down and be along side of a car across the start finish line attempting to pass,” explained a miffed Lia after the race. “It's kind of like what happened in the Busch Series in Texas a few years ago. They dropped the green flag and nobody went. I pulled down low and could have passed four cars on that restart but because I didn't want to get black flagged I rolled out of the throttle and stayed behind the #38 until we crossed the start-finish line. Then after the line I sent it in underneath him in turn-one. Lia's #18 had to come back from the rear of the field. “I don't know what their problem was black flagging me? I was behind him so I don't know what they were looking at. Jason Myers left the Friendship Sunday Modified show feeling a lot better than when he showed up to the Speedway. Myers struggled all morning with a stomach virus that had him feeling under the weather. But in the race, he put that sickening feeling behind him, stayed out of trouble and finished third when the checkers waved. YANKEE GO HOME....ANY WAY YOU CAN! Ted Chistopher is used to traveling in cars and helicopters back and forth to several race tracks, sometimes all within a single weekend. But after the Friendship show, the winner's biggest worry was just getting back to Connecticut. “Now I just have to figure out a way to get home,” laughed TC after the race. “I had a flight early because I wasn't sure if I was even gonna come (to Friendship) today. We said that if we made it out of Ace (Whelen Southern Tour show) we would come here. When Ace got rained out we said we are coming here. So then I changed my flight. That flight I gave up and I got a one-way ticket for a hundred bucks out of Greensboro because Raliegh is so far from here. The sleeper in Ryan Preece's rig was the winner's way home from North Carolina. 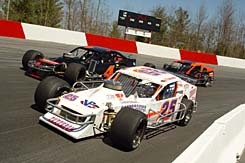 - 26 Modifieds showed up at Friendship including two NASCAR Mod Tour resulars (Christopher and Lia). - John Smith was running in the top-five but several cut tires finally put an end to his day. -Bob Park finished a solid fifth at Friendship. Park says he will be running Friendship on a weekly basis rather than updating his racecar to run on the NASCAR Tour. Bob's son, Craftsman Truck Series star Steve Park was in the pits to watch his father on Sunday. 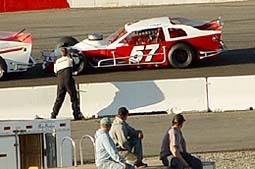 - Earl Baker came back from a couple of tangles with Burt Myers to finish 7th. 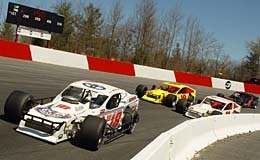 John Smith (#19) battles with the Myers brothers , Jason in the #4 and Burt in the #1.
plans of running for Rookie of the Year honors at Bowman Gray Stadium this year, raced at Friendship on Sunday. He finished 15th. - The young guns were plentiful at Friendship. Several drivers on hand who do not meet the 18-year old ager requirement to run the NASCAR Whelen Southern Tour are planning on running various Mod shows in the south. Those drivers include Luke Fleming, Johnny Sutton, Ryan Preece and Josh Nichols. flight. 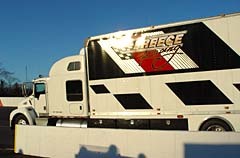 Now I am going to ride home with the Preece's in their rig. They have a sleeper in the back. At least I found someone that is going to Connecticut!